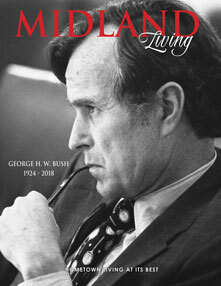 In this issue we pay tribute to the passing of our nation’s 41st president, George H. W. Bush, honor our Veterans and share the great people of Midland’s passion for their community. Midland is full of talented, caring people and we are so blessed to have a platform to share their stories with you. Now that 2018 is in the rearview mirror, we look forward to what 2019 has to offer. Many people will be reflecting on the past and making resolutions. Consider making one of your goals to bring the change that you want to see around you; join a committee, volunteer, shop local and be a good neighbor. Fill your thoughts on New Year’s Day, not with what you have yet to accomplish, but in things that are still possible to achieve and the potential that the future holds. Read about the people in your community that are making a difference, check out the articles about the American Cancer Society, the Salvation Army & the Aphasia Center for ideas of where in your community, you may be able to affect the lives around you in the new year. YOUR FREE COPY: We want to thank our advertisers. Let them know you saw their ad in this issue. It is thanks to their support that this magazine goes to the public free of charge! 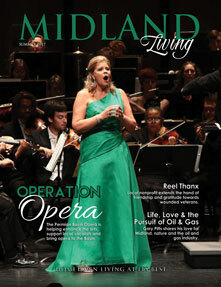 This issue is full of great people in our community using their gifts for good in a variety of ways. We are each given different talents, but what good are they if we keep them to ourselves? Let your light shine by using those talents as you are called to do! What are your gifts? How can you put them to use today? A small act can make a big difference in someone’s life. I love this time of year. Although each new day really is a fresh start, most of us are not as intentional with that clean slate as we are in the New Year. Instead of resolving to eat healthy and exercise (which I should add to my list too) I want to resolve to be present with my family – including my extended family. Last year I copied and scanned every picture I could find from my 92-year-old Grandmother and asked her to label the names of the faces as I pasted them to blank pages…these faces from the past brought our family to where we are today. 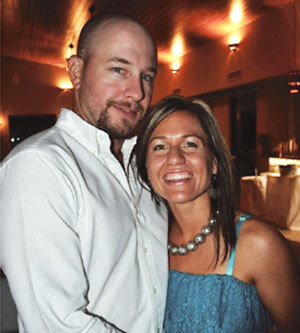 It is a reminder that the decisions Matt and I make today have a ripple effect for our family tomorrow. In 2018, we will be praying and resolving to make positive ripples! Take a peak at a few of the images I scanned in 2017 of my sweet mother enjoying Christmas as a child here at home in West Texas. On behalf of Midland Living and our advertisers (see a full list in the back of this publication) we thank you for shopping local, not only during this past Christmas season, but year round. I am so excited about our content this issue! There is a variety and something for everyone – take a moment to consider if there are any human interest stories we should know about and contact our content coordinator Tabitha to submit your idea today. 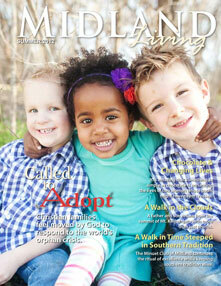 I am especially excited that my old boss Gary Pitts, along with his sweet wife, agreed to be featured in this issue. I have fond memories of working with him, along with all of the other great staff members while I was at EOG Resources. Gary and I would meet for an early breakfast occasionally to discuss business at IHOP and there was seldom a person who passed our table who did not stop to greet him. Friendly people like Gary and Michele are what makes Midland great. The articles in this issue weave a theme of wellness not only of the body, but for the mind and spirit too. Our town is built on neighbors helping neighbors – which is the Texan way. Read about the many touching stories from the Buddy Walk, De Colores – shopping with a purpose, to Linked In and see how you can take part in the caring culture that is Midland! Everywhere you turn there is a place to put your talents to use and to make a difference in the life of another. We should each challenge ourselves to make a resolution this year to get involved and give our time to a worthwhile cause. This is one resolution that will have a lasting affect – not only to ourselves, but to the community at large. With resolution in mind, we invite you to take a peek at Super Docs; an exclusive section showcasing the many qualified physicians in our area. Their specialties vary, but their attention to caring for you – the patient does not. So don’t put off what ails you any longer and scroll through this list to find a doctor near you that’s right for you. If you are new to town use this as a guide to help acclimate yourself to Midland-Odessa and keep your care local. 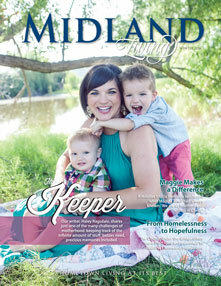 As always, we thank you for reading Midland Living Magazine. We strive to show you the many people, places, and things that highlight the numerous positive attributes of the Permian Basin! It is with heavy hearts we share that one of our longtime writers, Midlander, Mrs. Sue Wallace Conder Hardy passed away suddenly in June. She started with us in the summer of 2012 sharing her own story entitled, “A Year at the Ranch” about her year living on LBJ’s famous ranch in South Texas. Since that time she has shared many feature stories about her neighbors and friends with us. In the current edition her latest work highlights Jim Henry in “Secrets to Success.” We thank Sue and her husband, Jack, for their many creative contributions to Midland Living Magazine. We love Midland and are grateful for our readers and our advertisers who allow this coffee table quality magazine to be free to you. Please tell them you saw their ad in this publication so that they would continue to support Hometown Living at its Best! Check out the Index of Advertisers (in the back) and remember to Shop Local! 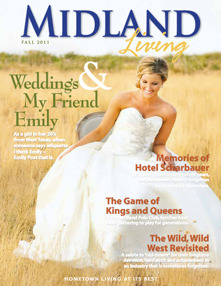 With Wedding season here, make sure to contact us to have your engagement, wedding, or anniversary featured in the next Midland Living issue. Call 817.599.6167 or email kati@ hometown-living.com. On the cover, ‘The Keeper’ is an article any mother can relate to. My children are 4 and 1 and this article captures the essence of any outing with my precious toddlers. Whether you are in this season now or it is a reminder of days gone by, it is sure to bring tears to your eyes thinking about the sweetness of this time with your children. Please check out a few of the many Christian philanthropies featured in this issue and know there is always a place looking for a helping hand from you! There is an organization and place that fits your interests and talents. Get involved and make Midland your own! Find a church, meet your neighbors, and get involved! Take pride in your hometown (be it new or old) and look for the good around you. On the cover this issue is National Title holder, Emerson Gotcher (17). 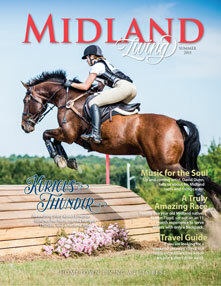 Read her amazing story and how she is representing Midland well in Kurious Thunder. We feel so blessed here at With You In Mind Publications and we thank God for His many blessings to our business, community, and state. Read how He is working in the lives of two other locals, David Dunn (Music for the Soul) and Robert Floyd (A Truly Amazing Race). “For it is God who works in you to will and to act in order to fulfill his good purpose (Philippians 2:13).” Remember He has a plan for you too! This is YOUR hometown magazine; leave your mark by sharing local events for our Hometown Happenings section with us. Email Content Coordinator, Crystal for submission details or questions. Wedding Season is HERE! Please see our ad for information on submitting your wedding announcements (call for pricing and deadline – Ask about DISCOUNTS). Send your wedding announcement questions and submissions to Matt (email below). WYIM is growing and we continue to be on the SEARCH for sales people in the Midland and Odessa area, as well as, writers and photographers (beginners and seasoned). Call our office or email Matt to learn how you can get involved in future publications! 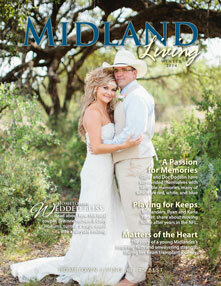 Do you WANT A SUBSCRIPTION to Midland Living Magazine? Email our Office Manager, Kati, and let her know you want on the MLM digital subscription list which will alert you to view our magazines online at www.hometown-living.com. 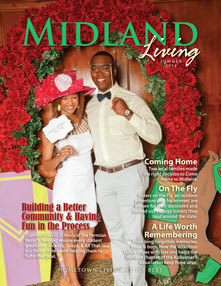 ‘LIKE’ us on Facebook at: With You In Mind Publications for additional updates on Midland Living Magazine. We want to thank our advertisers as always for their participation which keeps MLM coming to you FREE of charge! There is no better way to show HOMETOWN LIVING AT ITS BEST, than to spend your hard earned money here in your hometown. Check out the Index of Advertisers list (located at the back of the magazine)! Winter is officially here and this issue of Midland Living is full of stories about local people and their contribution to an already amazing place! Read about some pillars of the community like chamber president Bobby Burns as we give you an inside scoop on the man behind the title, as well as Sheriff Painter as he gives us insight into his exciting career in law enforcement! We want to thank you all for the many submissions of article ideas and Hometown Happenings! This truly is a magazine for the locals by the locals so keep them coming! Email ideas to our Content Coordinator, Crystal. To have your wedding featured in the Summer edition please call our office! As always please don’t forget to check out the index of advertisers in the back of the magazine and SHOP LOCAL! Need extra copies of the magazine? Pick up your extra copies today at the Chamber of Commerce downtown or ANY advertisers office. Also, view our magazine online at www.hometown-living.com and ‘LIKE’ us on Facebook at: With You In Mind Publications for additional updates on our Texas and Oklahoma magazines. 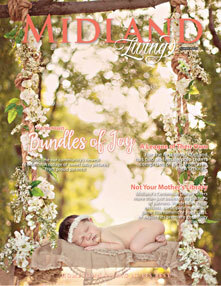 At Midland Living Magazine we have kicked summer off right! Midland has been busy not only renovating the historic downtown (check out When Old Becomes New Again ), but investing in our youth (on the cover: Building a Better Community & Having Fun in the Process )! Take a look at the many organization events hosted raising money and putting those proceeds right back into this awesome community. On that note, I would like to introduce our two newest employees. Kati Beggs, Office Manager, and Hana Miller, our new Content Manager. We want to thank our advertisers! Please help us to show appreciation by SHOPPING LOCAL and mention that you saw their ad in this publication! 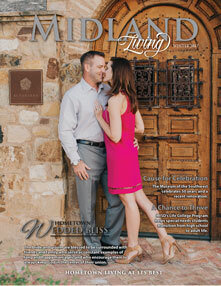 Their participation allows Midland Living Magazine to come FREE of charge to you! Check them out in the Index of Advertisers (page 199 of the magazine) and go by to get your copy today or if you see a copy please know you can take it home with you. Also, view our magazines online at www.hometown-living.com & ‘LIKE’ us on Facebook at: With You In Mind Publications for additional updates on WFL and our other Texas and Oklahoma magazines. Winter is officially here and with it comes good food, fellowship with family and for me a few extra unwanted lbs! I trust that the Christmas season treated you well and that you’re looking forward to new beginnings with the New Year upon us! We have so much to be thankful for as God continues to bless us all. Without Him we truly have nothing. As always we want to thank our advertisers for their involvement – help us to thank them by Shopping Local. Their involvement allows this publication to come FREE of charge to you! Check them out in the Index of Advertisers (end of the magazine) and go by to get your copy today, or if you see a copy please know you can take it home with you. To view our magazines online visit www.hometown-living.com & ‘LIKE’ us on Facebook at: With You In Mind Publications for additional updates on Midland Living and our other TX and OK markets. 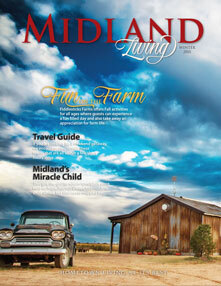 As Midland and the surrounding communities are booming,we here at WYIM Publications are committed to keeping your HOMETOWN magazine true to Midland’s roots. Midland is a warm community, welcoming newcomers with open arms. As change is a part of life, we want all of those making Midland their new home to know what a hardworking, Christian based, honest and frankly….classy community they have chosen to call HOME. We are excited to call them neighbor and would like to show our readers what a few other neighbors have been busy doing to proudly put Midland on the map. 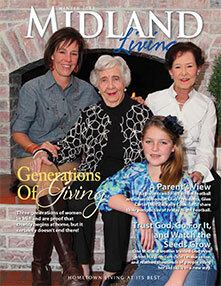 We also want to continue to feature longtime Midland families and traditions within the pages of MLM. Take a peek at Don Parks’ studio. As a retired Midland businessman and renowned artist, Parks truly has a Passion for Painting. 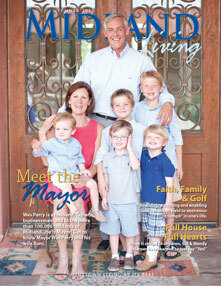 On the cover, Mayor Wes Perry and his darling wife, Roni, are enjoying their five grandsons! Find out a little more about Mayor Perry as Midland Living met up with him in hopes to get to know more about the man behind the title. Once again from all of us at Midland Living, we want to say thank you for your support. We especially want to say a big Thank You to our advertisers. We would encourage you to thank them as well by shopping local! Without their contributions, this publication would not be possible. Please see the Index of Advertisers to pick up your complimentary copy today. You can also view the magazine online at www.hometown-living.com &‘LIKE’ us on Facebook for additional updates at - With You In Mind Publications. 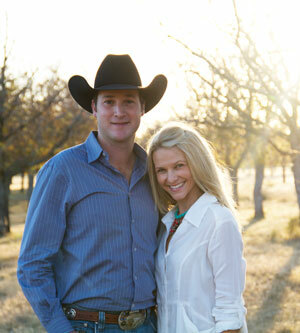 We hope you all had a blessed Christmas season and we look forward to the springtime ahead! 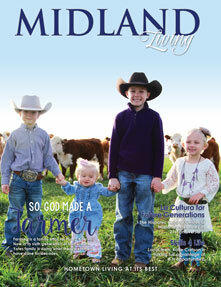 This issue of Midland Living has been fun for all of us here at WYIM because your community has truly made our job easy by sharing all that you have been busy doing. There are so many people and places with a story to tell that we seem to find a hidden treasure around every corner. With high school football coming to a close, please read from Booster Club Presidents, Carter and Cook, about their view from the stands. Sports fans will also be interested in the personal account from Professional Football Player, Baron Batch, who is proud to call Midland his hometown. There are a slew of events captured in our Hometown Happenings (spread throughout the publication), take a peak to see who was where, when! As always we want to thank our advertisers for their involvement – help us to thank them by shopping local! Their involvement allows this publication to come free of charge to you! Check them out in the Index of Advertisers (last page of the magazine). We give thanks to God for another memorable year and great things to come.